In 2006, two finance professors at the Yale School of Management, Martijn Cremers and Antti Petajisto, began circulating a paper that introduced a new way for investors to evaluate actively managed mutual fund portfolios. Their proposed measurement, “Active Share,” was widely adopted by the finance industry, quickly becoming one of the most popular ways to measure the difference between the portfolios’s holdings and their benchmarks. But recent research by Cremers, who now teaches at the University of Notre Dame, suggests that investors should be cautious in how they use it. Active Share is a score assigned to each mutual fund, from zero to 100, based on how much its portfolio weights differ from the fund’s benchmark index — for example, the S&P 500. A portfolio with exactly the same weights as the S&P 500 in the 500 companies that make up this index would have an Active Share of zero, while a portfolio that didn’t overlap at all with the S&P 500 would have an Active Share of 100. Actively managed mutual funds charge higher fees than index funds, also known as passive funds. Many investors are willing to pay that premium because they expect the actively managed mutual fund, under the direction of a skilled portfolio manager, to outperform the benchmark. Unfortunately, many of these mutual funds do not do much stock picking or are even “closet benchmark funds,” charging high fees for a portfolio that largely mirrors that of the index. Knowing a mutual fund’s Active Share score is a critical tool that investors can use to avoid these closet benchmark funds and find true stock pickers. Before Active Share, the most common measure of active portfolio management was by tracking “error volatility,” which represented the volatility of the difference in the returns between a fund and its benchmark. But tracking error volatility has a number of flaws. For instance, well-diversified “stock picker” portfolios may have a lower tracking error than less-diversified “sector rotator” portfolios, even though the latter funds may have substantially more overlap with the benchmarks. This finding in particular drew the finance world’s attention. Soon, the two scholars were being invited to address groups of investors around the world. In 2007 and 2008, Cremers gave presentations in Rome, Milan, London and Amsterdam. Morningstar, the independent investment research company, adopted Active Share as one of its mutual fund measurements. Cremers and Petajisto’s paper was finally published in 2009 in the Review of Financial Studies, exposing even more people to the idea. “Of all portfolio measures invented over the past decade, Active Share has become by far the most popular,” Morningstar analyst John Rekenthaler wrote in 2014. In response to these criticisms, Cremers, who recently was named the Bernard J. Hank Professor of Finance at Mendoza College of Business, began writing a series of papers clarifying and refining his original findings. 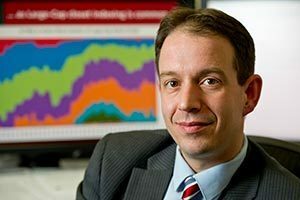 In 2016 he and Ankur Pareek of the Rutgers Business School published a paper in the Journal of Financial Economics showing that, among high Active Share portfolios, only those with “patient investment strategies” — those with stock holding durations of over two years — were able to outperform their benchmarks. Cremers saw this as a way to correct a common misunderstanding about Active Share — one he admits his original paper introducing Active Share have inadvertently encouraged. Originally published by Michael Hardy at news.nd.edu on February 27, 2017.